Enveloped, spherical to pleomorphic, 150-200 nm in diameter, T=16 icosahedral symmetry. 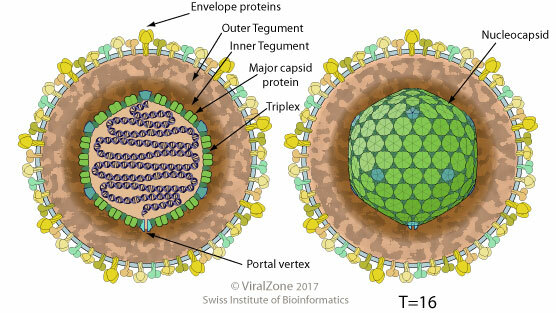 Capsid consists of 162 capsomers and is surrounded by an amorphous tegument. Glycoproteins complexes are embeded in the lipid envelope. Monopartite, linear, dsDNA genome of about 180 kb. The genome contains terminal and internal reiterated sequences. The viral interleukin-10 homolog down-regulates the expression of the TAP1 gene (transporter associated with antigen processing), thereby affecting the transport of peptides into the endoplasmic reticulum and subsequent peptide loading by MHC class I molecules. The EHV-2 v-FLIP protein (ORF E8) inhibits TNFRSF1A, TNFRSF6, TNFRSF10 and TNFRSF12 induced apoptosis. The UL24 protein induces a cell cycle arrest at G2/M transition through inactivation of the host cyclinB/cdc2 complex . Modulates the viral and host mRNA expression by exporting unspliced mRNA, thereby inducing alternative splicing.